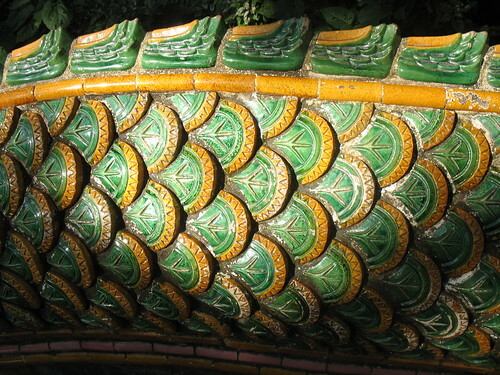 Last week I decided I would hike up Doi Suthep, the mountain outside Chiang Mai, to visit the temple on top. I planned to cut off-road to make the walk shorter. In total, I would cover nearly 12 miles of terrain and 1400 meters of elevation change. Aside from testing out my rehabilitated ankle (more on that Monday), I wanted to see the statue of Ganesha and make offerings. Buddhism is okay, but I’m a polytheist, and these gods are the cousins of my gods. You gotta meet the family. You know there’s a bus, right? Continuing onward, I found a back gate to the zoo and briefly considered sneaking in sneaked in. Then I thought about my life decisions. Wouldn’t there be a wall blocking my chosen route? Or maybe a lion pit? I didn’t want to detour to find out. Forsaking the zoo, I found out that there was a park farther up the road, sprawling around a beautiful mountain waterfall. This seemed promising. The waterfall zone was full of Thai people. It made me happy to see them on a holiday of their own and not just catering to Western tourists. I didn’t get a picture of them though, because I was tired. 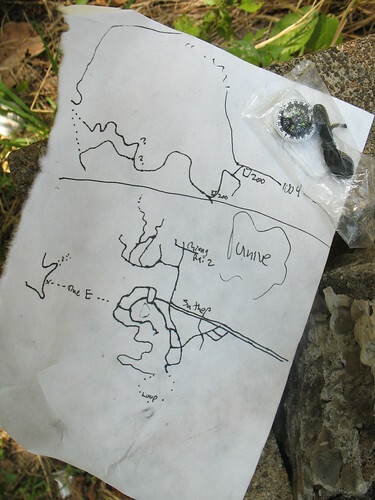 Trusting to my sense of direction I plunged off the main trail and up the mountainside. It was a steep, difficult walk but enjoyable. I found a hidden mountain shrine where I offered incense. At last I rejoined the main road. Songthaews and motorbikes whipped past me. Occasionally I’d see a bicycle, but no other walkers. On the lower part of the mountain, people beeped or laughed at me. A Thai family pulled over to see if I needed help. But higher up, things changed. The people going by could guess that I was hiking the whole way up. In America, they call that crazy. In Thailand they cheered me on. One Thai guy practiced his English: “You can make it! You can make it!” His girlfriend smiled from behind him on the motorbike. The last two kilometers (mile) were rough. I stumbled up a steep, hairpin ramp of a road. 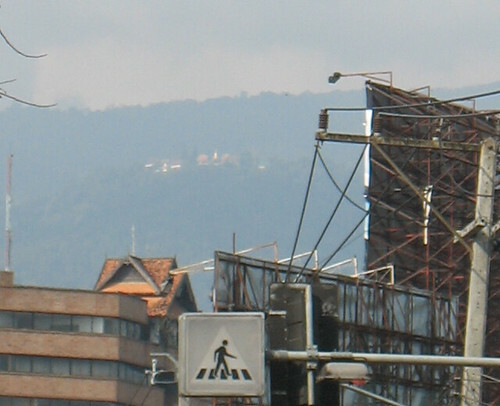 At the top is a tall swift waterfall and the temple grounds. I sat down next to an old Thai worker. I gulped water. He looked me up and down. He broke out into a huge grin and told his friends in Thai. They grinned too. They were really happy for me. I put a coin in the waterfall for the mountain spirits and picked myself up. I wasn’t done yet. I had reached the parking area. 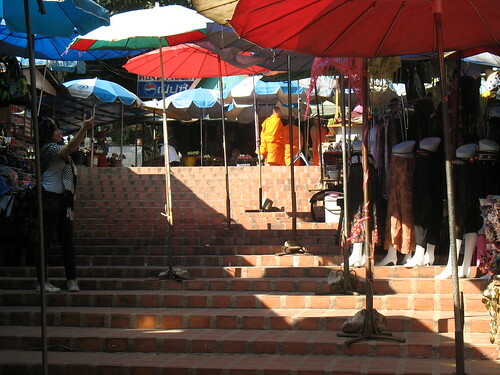 Beyond that is a strip of vendors, some steps, a small bazaar, and the final staircase to the temple. I don’t hold anything against the tourism industry. The Thai people didn’t seem bothered at all that there was this strip of capitalism on the temple steps, so it must be okay. But I did find it disconcerting that lots of grilled and fried meats were served on the threshold of a Buddhist temple. Most Thai are not vegetarians but their Buddhist monks are. I kept waiting to cross an invisible line past which the only street food would be vegetarian, but I hope you like sausages. On the other hand, this is a great place to buy holy items. 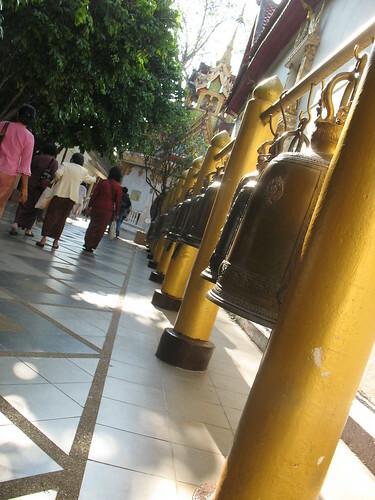 There were merchants with bells, vajras, statuary, prayer beads, incense, and all the other trappings of Buddhist ritual. I’m sure it costs more to buy them here than it does in town, but it felt really special seeing people pick them out at this mountaintop shrine. I didn’t need any Buddha kit but I bought a simple walking stick. It’s nice knowing that my walking stick for future adventures came from a pilgrimage up Doi Suthep. …and you should’ve chose the dragon. Those last 300 steps are a killer, so the kindly monks have installed a tram you can take instead. But if you have two working legs and take that tram, I disown you. 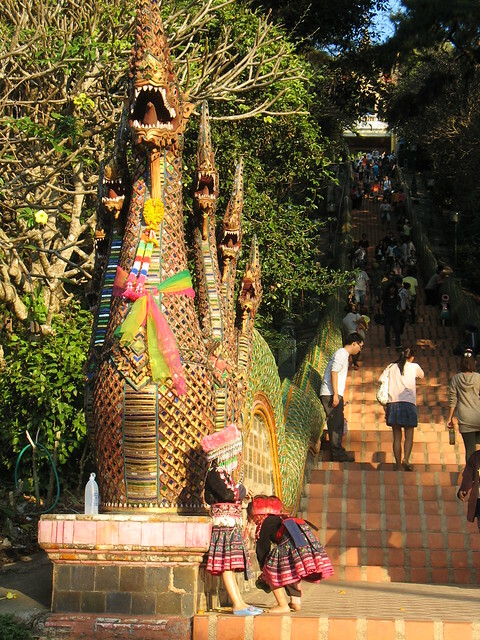 Instead, follow the 70 year old Thai grandmas up the steps. There is an awe and a joy that comes with the final ascent. The layout of the temple is simple, but quite large. I won’t describe it here because exploring it was my favorite part of the whole trip. It was like unlocking a new area in a video game. You know there’s a treasure or a secret there, you just need to go find it. Though you may need the hookshot. In my case, the statue of Ganesha was the treasure to seek. I picked my way around the temple grounds, barefoot. I left my shoes and my entire backpack unattended for about two hours at the temple entrance—I have a hard time imagining theft at a temple in rural Thailand. Though you notice I didn’t leave my camera there. I purchased three candles, two incense sticks and a lotus (these come bundled altogether for about 20 baht—I recommend purchasing inside the temple so you know the money supports the monks). 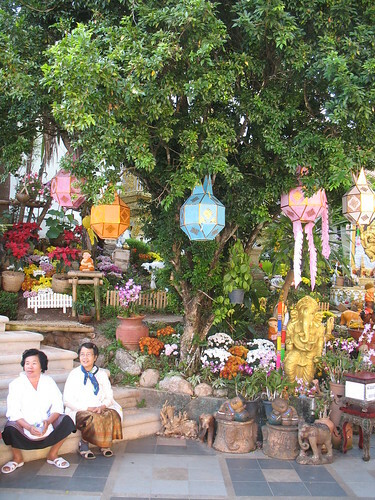 I perambulated about the chedi three times saying my prayers, observing careful etiquette. Then I went before one of many oblatories and made my offerings. I’m not a big fan of asking for stuff in prayer, least of all from Buddha who would’ve discouraged the practice. But I figure my sister, who is in a monastery becoming a lama, has worked pretty darn hard for this Buddha fellow. I told him to look out for her. I offered the second candle for my late friend Jinpa, a Kagyu/Nyingma monk who traded practices with me. The third one was for Ganesha. After all that I still hadn’t found the Ganesha statue anywhere. 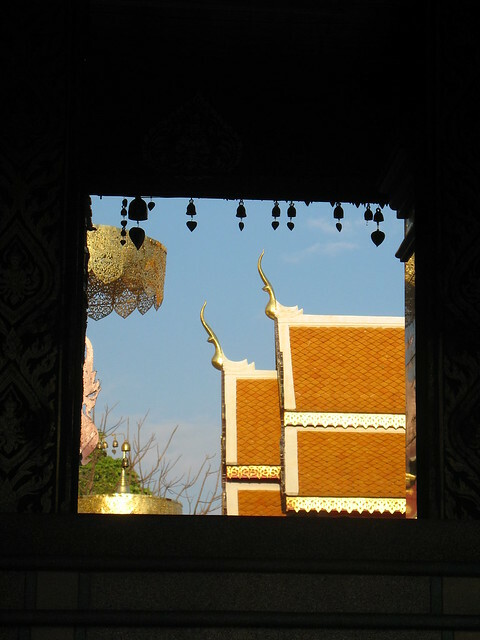 I had been through every nook of the main temple, but no elephant-headed deities to be seen. But the art was alright. I went back out of the main temple and circled the temple grounds. 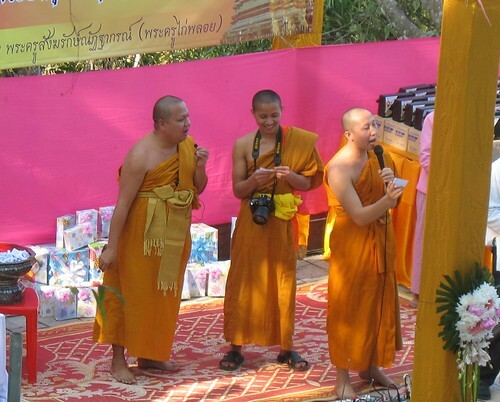 In an amphitheater, about 150 Thai people listened to some jokester monks putting on a show. They drew names to give away presents. Better yet, just like at every church raffle in America, the monks could not figure out how to pronounce any of the names they drew. It took some looking but eventually I did find Ganesha. 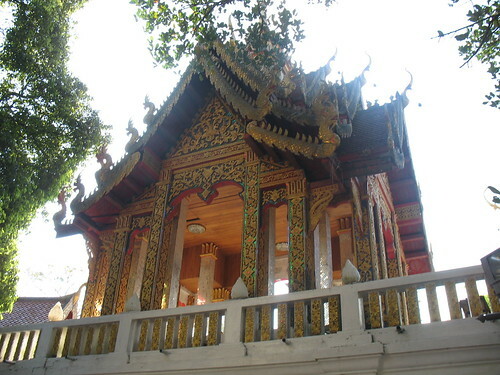 He is outside the main temple, in a garden behind the building. There’s another, stone statue of him a little deeper in the garden. That one has a place to leave offerings, though no place to kneel. There were signs of a few offerings left there but they seemed like an afterthought. Compared to the 108 Buddha statues inside the temple, each teaming with a trove of gifts, Ganesha looked neglected and forgotten. It gave me a bad feeling. The fact that Ganesha has a statue here at all means it was likely a Hindu sanctuary long before the Buddha even lived. In the West, we know that Christianity often destroyed or took over the sanctuaries of older religions. People seem to think Buddhism is all peace and flowers, but it has done the same thing. 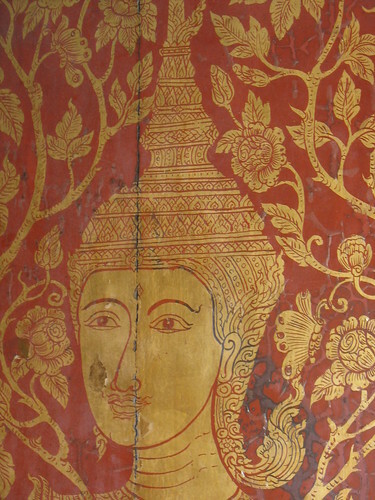 Many Buddhists in Thailand worship the gods along with the Buddha, but Buddhism takes pains to make sure it’s on top. I made my offering to Ganesha and, with a heavy heart, I finished my exploration. Eventually it was time to go. It was nearly dark, so walking back to town was out. I had a chance to hitch a ride, but I didn’t like the feeling of the person. Instead I joined a songthaew and, for the low price of 70 baht, got a ride all the way back to the Old City. I didn’t know it then, but even as I snapped pictures and frowned with Ganesh, someone I’d soon meet was less than a hundred yards away—someone who would later become very important to me. But that’s a story for a different time. Please tweet or share this post. Wanna know something about the Wat? Just ask! Thank you Victor. I appreciate it! 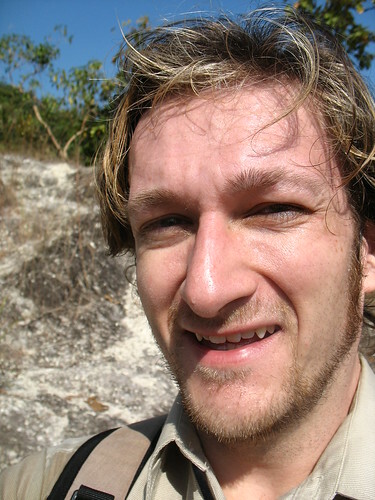 Some great photos Drew, that’s great you’re chronicling the trip, I would love to visit Thailand one day. I’m applying for english jobs in South Korea now so may just head down there one day. Keep it going, man! If you do come to Thailand I would recommend a different approach than what I took. Assuming you want northern Thailand (rather than beach resorts down south), I would spend at most a week in Chiang Mai just because it’s an experience, then bail. Either head NW to Pai or NE to Chiang Rai. I can vouch for Pai personally as a small, fun, lively, but relaxed vibe. 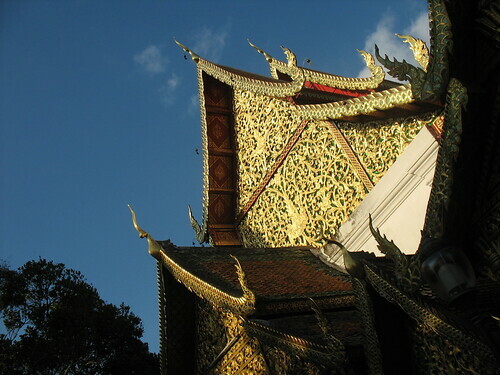 I haven’t been to Chiang Rai but all my traveler friends say good things about it. There is probably more to do around Chiang Rai, and you can drive the mountain highway along the Burmese border, which has good hiking and camping. Pai is a bit more of a “hang out and relax” kind of place. Of course, rent a scooter and drive yourself… way more fun than the bus! Thank you for reading & for your comment! By the way I have two friends (a couple) who just received teaching positions in S. Korea starting 2012. If you end up going let me know and I will connect you guys. Love it! Glad you didnt’ need the hookshot to find Ganesha. I wouldn’t have said no to a hookshot, mind you. Good writing, nicely illustrated! More please. Thank you Kira. I will admit it is a lot of work and time to deal with all these photos (100 or more exposures to get one good shot, as you know) and then edit them and write them up. I will try to do photo tales when I can though. I am still toying with the idea of making a separate site that just has short blurbs – 1 photo and some of my inner thoughts or a funny experience from that day. I think one photo at a time would be easier to deal with and I could make it more intimate. Still not sure on the format though. I like the photo & thoughts/humor idea, but unsure if warrants a whole site on its own. Maybe a ‘Monday’s Photo Moments’ on your regular blog? “These gods are the cousins of my gods. You gotta meet the family.” Love that. This was a very enjoyable read. My favorite photo was of the Hmong girls, they were so sweet and beautiful. I also love the last photo. And I love the photo you took of your map… I remember your hand drawn maps. It made me home sick (or is that Drew-sick?). In any case, thank you for sharing. I miss you. The photos are lovely. I think the one of Ganesha is my favorite. Also I think it’s really amazing that the Thai people cheered you on instead of discouraging your journey. Aw Abby that is sweet of you to say. Thank you. Funny, I wasn’t a fan of the Ganesha photo but the more I look at it the more it grows on me. I am only just now getting through the back log of blog posts, and am glad a fair bit of it is from you, as it is always a pleasure to read your words. Thank you for sharing this trip with us. The pictures really set the stage well for this story, and I particularly liked reading about you looking for Ganesha and finding the old distant one that got your visitation and offerings. I wonder what your thoughts would have been if you couldn’t find him? It was pleasing to read about your sister and her doings, it is nice to know a bit about your family and how you two are similar, yet chosen fairly different paths. Is there a story behind that? I hope that the hike didn’t irritate your ankle, even though it would have likely been worth it anyway. Glad you made it there and back safely, and looking forward to reading about this important person you met. Drew, I absolutely relished in this post! While I did not make the trek up to this temple, I certainly felt as if I did after reading your beautiful description. The photos are fantastic as well, and I can’t wait to read more about your mysterious new friend. So glad you enjoyed your journey, looking forward to keeping up with you for your future adventures as well!